Hoping for a quixotic staycation at a hotel, but you don't have a credit card to pre-book it? Or, you do have one but you don't want to use it for some reasons. Fret not! TrvelBook.ph had solved your misery. TravelBook.ph exclusively now offers Pay-At-Hotel, No Credit Card Needed. This program is an innovative payment method that allows travelers to secure a room in advance without having to provide credit card details or make initial deposits to banks or payment centers. Like most of everybody, all my booking transactions, have been completed using credit cards, this process is the same with most e-commerce outfits, including online travel agencies which require their customers to make initial transactions through credit card payments or over-the-counter deposits in order to complete reservations. Of course, we do understand this as as customers as I too have a property registered at Airbnb. While such process is important and necessary, TravelBook.ph—the leading OTA dedicated to offering hotel accommodations in their best value, wants to make traveling easier right from the very beginning. 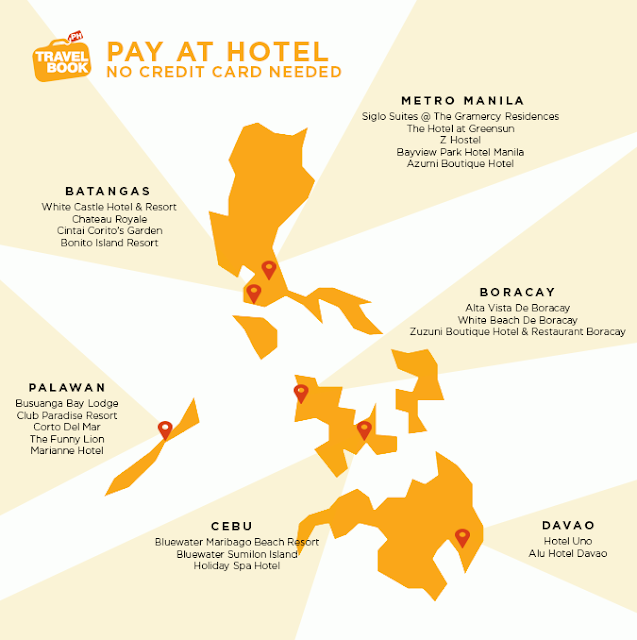 Highly-regarded hotels in key areas that offer Pay-At-Hotel, No Credit Card Needed. Recognizing this dilemma, TravelBook.ph approached their hotel partners one by one to encourage them to join the program and ensure each of them that the risk of no show will be properly addressed. With this in mind, the company set terms and conditions to make sure that their members adhere to proper customer behavior so they can continuously enjoy the benefits of this hassle-free option. Because of the convenience that comes with Pay-At-Hotel, No Credit Card Needed, Filipino travelers have already been using this payment method when booking their hotel accommodations. In just a span of one year, TravelBook.ph has recorded an unprecedented growth in bookings made using Pay-At-Hotel, No Credit Card Needed. As of April 2017, Pay-At-Hotel bookings has an average YOY growth rate of 691%—an outstanding percentage recorded almost a year after its launch. That’s almost seven times higher in just eleven months (April 2017 vs. May 2016). 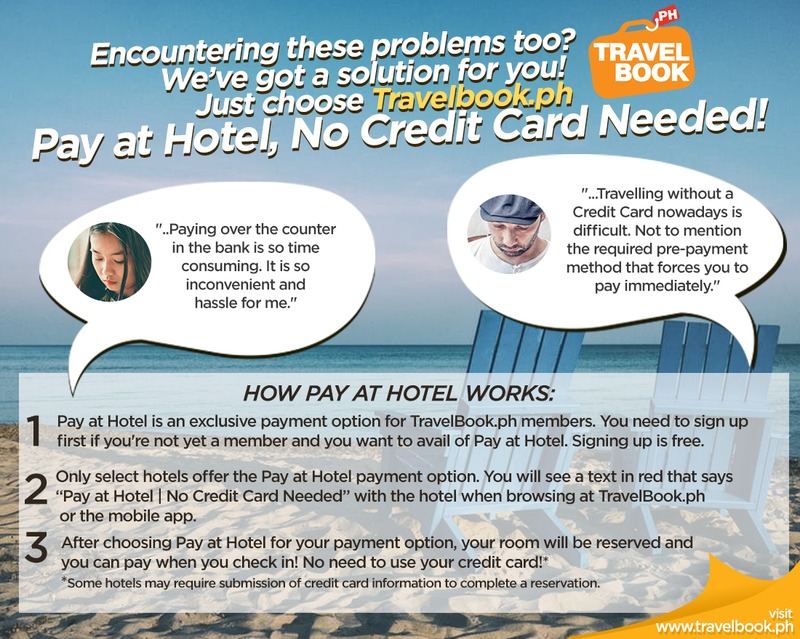 Pay-At-Hotel, No Credit Card Needed is TravelBook.ph’s answer to online booking inconveniences that are usually faced by Filipino travelers who do not own credit cards. “Filipinos are still averse or allergic to credit cards,” says a report released by The Credit Card Association of the Philippines (CCAP). Since most OTAs require credit card details to complete transactions, this has become a usual problem when booking online because 90% of Filipinos are non-credit card holders. Even during instances when customers do have credit cards, Filipinos are still hesitant to provide details online because of the threat of fraud and fear of identity theft that are commonly associated with online transactions. In addition, Pay-At-Hotel, No Credit Card Needed also meets the customer demand for convenient transactions. Since this payment method allows direct transactions with the hotel of their choice during their check-in date, it further cuts out the inconvenience as travelers no longer have to find time to look for banks or payment centers for over-the-counter deposits or transactions. All they need to do is show up on the day of their check-in and pay at the hotel’s reception. Without a doubt, Pay-At-Hotel, No Credit Card Needed revolutionized the way customers pay for their online hotel bookings. It has proven to be the most beneficial payment option to date as it opens endless opportunities for Filipinos to travel and explore the Philippines. 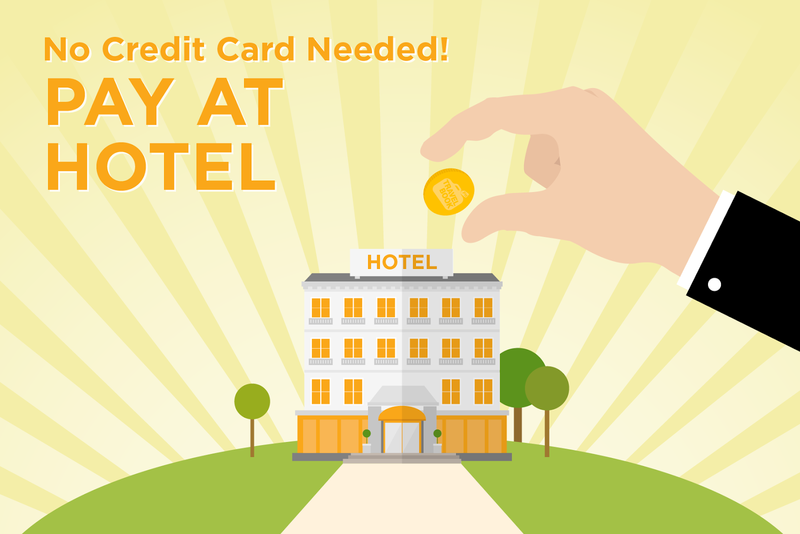 Want to use Pay-At-Hotel, No Credit Card Needed for your next hotel reservation? Ready to book your stay somewhere? Do check TravelBook.ph's link below at this blog.